Bigger, healthier fish, free of hormones, colorants, pesticides and prophylactic antibiotics free fish live in gigantic round or diamond shaped holding tanks off coasts. This is the next generation of fish harvesting called Open Ocean Fish Farming, which strives to be a sustainable and healthier source of fish for the rapidly growing human population. 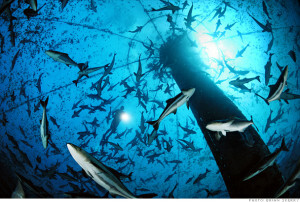 There is a growing global fish crisis as the world population rises and consumes more fish in its wake. According to World Watch Institute, as of 2009 wild fish stocks around the world are 57% fully exploited, 30% overexploited and just 13% underexploited which is causing destructive effects on marine life. Every year there is about 7.3 million tons of bycatch, unintended marine life caught in fishing net, which is thrown back into the ocean either dead or severely injured such as dolphins, sharks, turtles, whales and many other species. These problems are associated with open water fishing, but there are also hoards of problems that come with fish farm plants where fish live in an unnatural environment that requires antibiotics, antifungal and antiparasitical agents to keep them alive. Conditions such as these are not only bad for the fish, but also transfer to the humans who eat them. 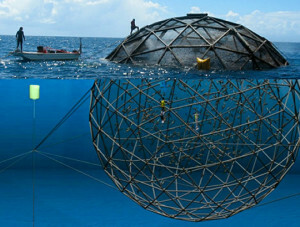 The fish are in pods located off shore where their waste is taken with the ocean, allowing a constant flow of new water. This new technology of fish farming could bring sustainability to a market that is currently destroying the earth’s aquatic environment. 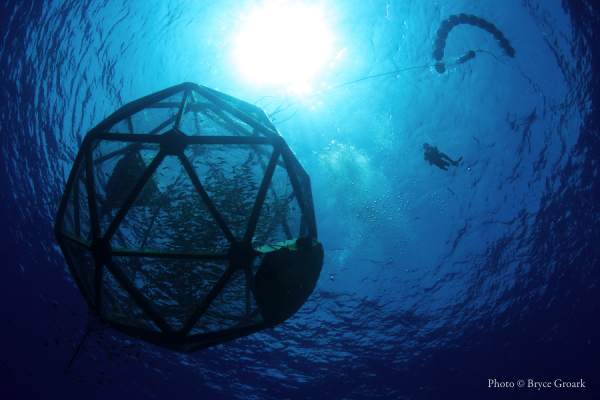 Through a man named Brian O’Hanlon, the start of open ocean fish farming has begun with the birth of Open Blue, a small business founded in 2007 that is currently producing 20-25 tons of Cobia in 1 harvest and is working with new innovative technologies to improve the way we harvest fish. With the earth’s human population expected to grow to 9.6 billion by 2050, according to the UN, there is a huge change that needs to be made in the way we harvest marine life.